Thai cuisine contains a spectrum of flavors and textures so vast that no two dishes are ever the same. Even tried-and-true dishes -- like everyone’s favorite, pad thai -- is open to interpretation and varies in preparation across the different provinces in Thailand. Thailand’s four regions -- Northern, Central, Southern, and Isaan or Northeastern -- each possess unique cultures, dialects, and treasured cuisines. The specialities within each region rely on the varying resources found within their respective environments: seafood and fresh coconuts in the South, mountain veggies and herbs in the North, intense chilis and sticky rice in the Northeast, and a hodgepodge of all those ingredients at the center. So if you find yourself retreating back to pad thai through every take-out order or visit to your local Thai spot, you’re missing out on some of the best dishes Thai cuisine has to offer. So here are 11 Thai dishes -- from khao soi to crying tiger -- you should order next time you’ve got a hankering for Thai food. This is a favorite in my family, and for good reason. It’s a fried rice dish that’s been tossed together with kapit -- fermented ground shrimp and salt -- until the aromatic shrimp paste coats the entirety of the rice. Unlike typical fried rice dishes that are studded with meats and veggies sauteed all together, khao kluk kapit’s accompaniments are served as a myriad of toppings: sour, unripe mango, sweet Chinese sausage (the best addition in any fried rice), shallots, chilis, thinly sliced omelette, dried shrimp, and marinated pork. This makes for a dish that is equally colorful as it is delicious, and no two bites are the same. Kana moo krob is the perfect way to get your greens in while still entertaining your tastebuds. 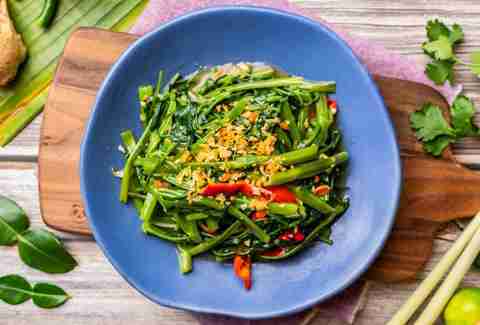 The dish is composed of Chinese broccoli stir fried over high heat with garlic, chili, and crispy pork belly, which is then tossed in a soybean and oyster sauce gravy that is a winning combination of sweet and salty. Eat this with a plate of steamed jasmine rice and you’re in business. Thailand is composed of four regions with very distinct cultures, dialects, and, of course, food. Nam prik noom is famous in Northern Thailand, where fresh veggies and young chilis are plentiful. This roasted, pounded chili dip -- composed of garlic, shallots, cilantro, fish sauce, lime juice, and green chilis -- has a smoky, garlicky, charred flavor and makes for a wonderful centerpiece in a northern Thai meal. Don’t be fooled by the ingredients -- nam prik noom is a lot less spicy than other regional Thai chili dips and complements sticky rice, fresh and steamed veggies, boiled eggs, and (my personal favorite) pork rinds perfectly. Tod mun pla is the quintessential Thai appetizer that should be on every table. 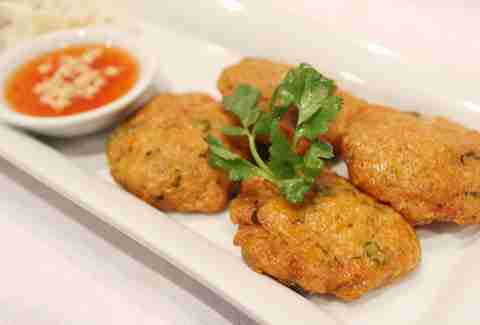 Essentially a Thai fish cake, the dish is made from fish paste and long beans, and flavored with red curry paste and kaffir lime leaves. The lime leaves give the dish a citrusy and aromatic fragrance. Tod mun pla is usually served with a sweet and refreshing dipping sauce, or nam jim, which contains chopped cucumbers, chilis, shallots, and peanuts submerged in a syrup of sugar, fish sauce, and vinegar. The result is a sweet-and-savory starter that can easily be transformed into a meal over a plate of white rice. Kai jeow is the unsung hero of Thailand. Every Thai kid has grown up on this wok fried omelette, which can be stuffed with a variety of ingredients. The two fillings I love most are the moo sab -- garlicky, peppery ground pork -- or nam -- a sour, fermented Thai sausage. The trick to getting a perfect kai jeow is cook over very high heat, resulting in a crispy on the outside, fluffy on the inside egg dish. You’ll never be able to go back to regular omelettes after this. 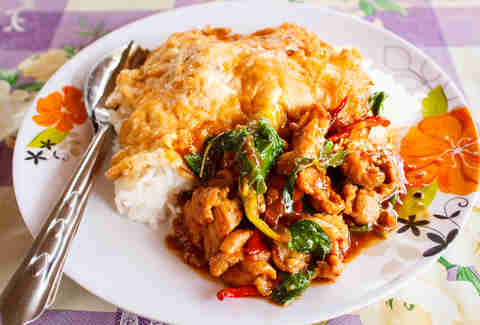 Crying tiger, one of my favorite Thai dishes of all time, hails from Isaan, the northeastern region of Thailand. Isaan is known for having very sapp foods -- flavors that are strongly spicy, sour, and salty -- and serving every dish with a side of sticky rice. Crying tiger is no different; the grilled steak arrives with nam jim jao, a spicy sauce that is so hot it’s said to bring tears to your eyes (hence the name, crying tiger). Steak, sticky rice, and hot chili sauce -- what’s not to love? 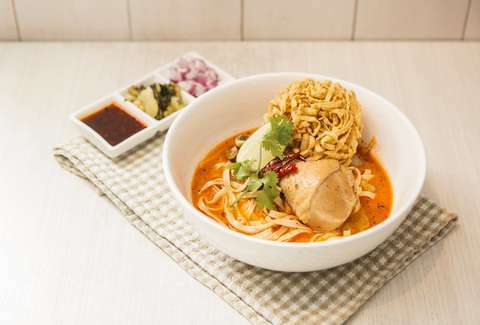 Having a great bowl of khao soi is a life changing experience. The best khao soi I’ve ever had was in Northern Thailand where the dish is considered a regional specialty. What makes this noodle soup so special is the balance of creamy coconut broth with sharp, pickled mustard greens, raw shallots, and crispy egg noodles. Squeeze fresh lime over the entire thing and you have a comforting bowl of different textures and flavors -- what Thai food is all about. You can’t go wrong with Thai noodle soups. They’re flavorful, customizable, and good to the last drop. Although boat noodles -- a pork and beef dish flavored with spices and fresh blood -- are typically the most popular of the noodle soup dishes in Thailand (and worth trying if you’ve yet to have it! 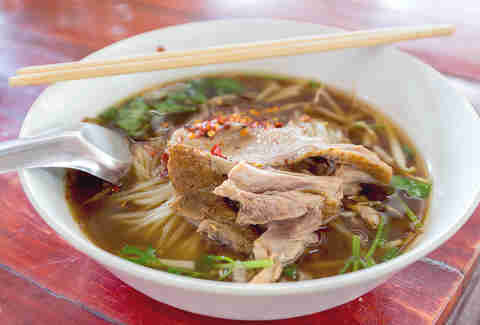 ), I’d also suggest slurping up a bowl of kuay tiew phet, or duck noodle soup. The broth gets its warm flavor from a blend of cinnamon, star anise, and five spice and delights when the duck has the perfect ratio of meat to fat. I prefer my bowl to contain flat, large rice noodles but the best part about Thai noodle soups is that you can choose your favorite style whether you like vermicelli, egg noodles, or glass noodles. 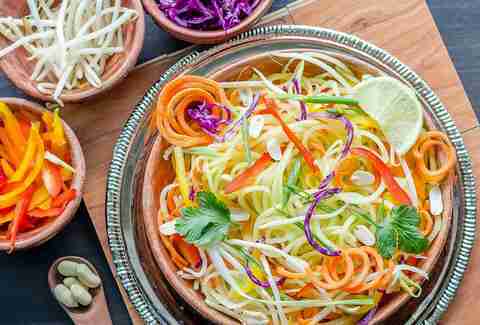 Papaya salad is a pretty popular dish that many Thai food aficionados tend to gravitate towards. And understandably so! The typical som tam which is usually found in Thai restaurants is sweet and spicy, sour and refreshing, and contains nutty and crunchy elements. 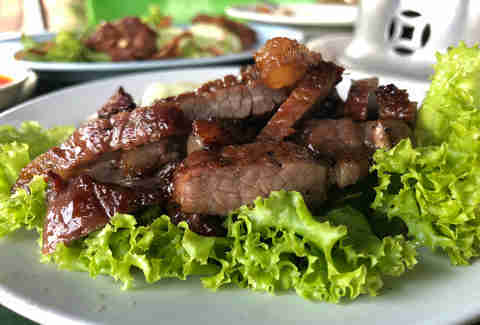 But the version most people overlook contains phu pala, or fermented crab, which adds a whole other element of flavor. Som tam phu pala still contains the fresh, crisp papaya you crave in a som tam dish but it’s paired with pungent, salty, and fishy crab that will no doubt convince you to order a second round. This dish literally translates to “red light stir fried morning glory.” The red light refers to the flames that leap up while cooking this dish on a wok, as well as the red Thai chilis that freckle the dish. Morning glory is a relatively neutral tasting veggie, so this dish dresses it up in a fermented soy bean, oyster sauce, and soy sauce gravy. 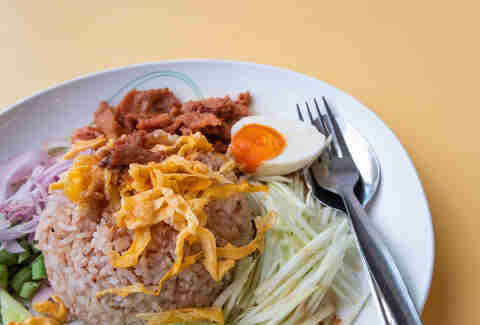 Eat this with a bowl of rice porridge for a filling Thai breakfast. I have something to confess: I’m not a fan of ripe mangoes, and therefore usually avoid the quintessential Thai dessert, mangoes with sweet sticky rice, but I love ruam mit. Ruam means “gathering” and mit roughly translates to “friends,” and it is a dish that is good to share. Ruam mit is essentially a delicious dessert gazpacho. 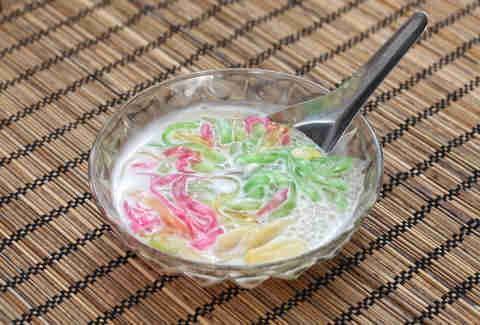 It’s comprised of a sweet coconut milk broth that that has sliced jackfruit, toddy palm seeds, pandan and coconut jelly, and crunchy water chestnuts coated in tapioca flour all served over ice. It’s the perfect way to cap off a spicy meal. Kat is a Bangkok born, LA raised writer. She spends her free time playing Settlers of Catan, finding the next best place to eat, and reading sappy YA novels. Find her on Twitter and Instagram.